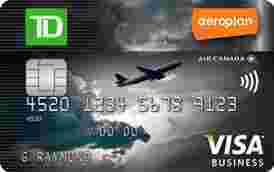 TD Aeroplan Visa Business Card is typically available to those with good credit scores (650 or greater). Also, receive 5,000 Aeroplan Miles if you have an existing qualifying personal TD Credit Card or qualifying TD Small Business Account. Earn miles twice when you pay with your TD Aeroplan Visa Platinum Card and present your Aeroplan Membership Card at participating retailers and the Aeroplan eStore. Get up to 40,000 bonus miles with products and services from the TD Aeroplan More Miles Business Bundle.